The perfect storage solution to organize your child’s bedroom, the Storkcraft Crescent 6 Drawer Dresser combines impeccable style and functionality in an affordable package. Sleek lines, elegant curves and oval, metal knobs accentuate modern flare, as this versatile dresser is designed to coordinate with any home furniture and will grow with your child well into their adolescent years. Featuring six spacious drawers on euro-glide metal tracks and safety stops, this dresser can securely store all your child’s clothes, toys and other belongings. Fastened with German cam locks and finished with high-quality laminate in a selection of rich colors and finishes, this dresser is durable and resistant against dirt or accidental spills. The Storkcraft Crescent 6 Drawer Dresser is stringently tested to meet or exceed all applicable Consumer Products Safety Commission (CPSC) and American Society for Testing and Materials (ASTM) safety standards, in addition to federal anti-tipping standards. 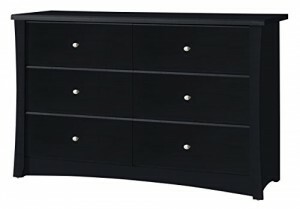 BEAUTIFUL DESIGN: The Storkcraft Crescent 6-Drawer Universal Dresser’s elegant curves and sleek lines bring a touch of elegance to any bedroom or nursery. This easy-to-assemble dresser is the perfect combination of elegant design & practical function. CO-ORDINATE YOUR STYLE: Designed to match any Storkcraft crib, glider, or change table, the Crescent bedroom dresser is ideal for organizing baby’s clothes, socks, onesies, even burp rags & diapers! Sturdy & functional, it fits seamlessly with any décor. ORGANIZATION MADE EASY: With 6 spacious drawers to fit clothes, accessories or toys, the Storkcraft Crescent Dresser will help you keep the nursery, toddler’s room, or kid’s room neat and organized. The stylish, sleek design will look beautiful for years.